The acquisition of the new western territories started a flow of immigrants to settle them. Then in 1848 the discovery of gold at Sutter’s Mill opened the flood gates. It soon became apparent that a coast-to-coast railroad line was necessary to rapidly move people, freight, and communications across the country. Everyone agreed that the railroad was necessary but where to put it was another matter. Great disputes arose between the proponents of northern, central, and southern routes, and even among different cities in the same state – everyone wanted the railroad to pass through their town. In an attempt to decide the location of the route impartially, it was suggested that all of the proposed routes be studied scientifically to determine which one was the best. In 1853 Congress passed the Pacific Railroad Survey Bill, appropriating $150,000.00 for the studies. Four separate survey teams were assigned to study the four main routes under consideration, with two supplemental surveys added later. The teams were given only ten months to complete their tasks. 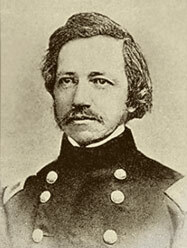 Lieutenant Amiel Weeks Whipple was put in charge of the 35th Parallel Survey. This is approximately the location later chosen for Route 66 across northern Arizona and New Mexico. 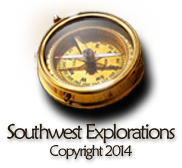 Whipple was to study the route from Fort Smith, Arkansas, via Albuquerque and Zuni, to California. Whipple’s expedition left Fort Smith on July 14, 1853. When all the personnel had joined him, the expedition consisted of about 70 men, 240 mules, a huge flock of sheep for food, and a train of large freight wagons. His scientific staff consisted of about 17 people, including astronomers, geologists, naturalists, artists, botanists, and surveyors. Antoine Leroux, who had been Sitgreaves’ guide two years earlier, was hired on as guide. The 35th parallel survey passed through Albuquerque and the Zuni Pueblo, crossing the 109th meridian (the eastern border of Arizona) on November 28. They proceeded generally west, taking a northward detour around Canyon Diablo, and passed south of San Francisco Mountains through the future site of Flagstaff. Farther west, instead of following Sitgreaves’ trail through the Kingman area, Whipple was hoping to find a better railroad route along the “Bill Williams Fork”, which he hoped would lead directly to the Colorado River. He therefore looped south along the Big Sandy and Bill Williams Rivers, reaching the Colorado near the site of Parker Dam. He then traveled north along the river, crossed into California near the Mohave Villages, and continued on to the Los Angeles area. Published travel diaries of the Whipple Expedition are not hard to find. Whipple’s daily itinerary has been published by Grant Foreman in A Pathfinder in the Southwest, John Sherburne’s diary is published as Through Indian Country to California by Mary McDougall Gordon, and H.B. Mollhausen’s German account was translated by Mrs. Percy Sinnett and published in 1858 as Diary of a Journey From the Mississippi to the Coasts of the Pacific (reprinted in 1969). There are also additional accounts by Whipple and Jules Marcou in volume 3 of the Pacific Railroad Report, and at least two unpublished diaries from other expedition members.